80 PLUS is an initiative to promote more electrical energy efficient power supply units. It certifies products that have more than 80% energy efficiency at 20%, 50% and 100% of rated load. 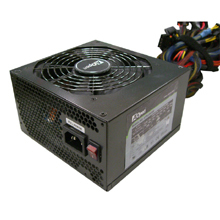 80Plus certified PSU waste 20% or less electric energy, thus reducing electricity use and bills compared to less efficient PSU. On the chart, you can tell that AOpen 80Plus PSU remains more than 80% of efficiency every loading. The Active PFC is short of Active Power Factor Correction. It is a technology used in computer power supplies. Active PFC is applied to the circuits that include induction motors as a means of reducing the inductive component of the current and generate a theoretical power factor of over 95% in the supply. Active PFC also reduces overall harmonics, corrects AC input voltage automatically, and suitable with full range input voltage. Active PFC is an even advanced method than PFC; therefore an Active PFC power supply is more expensive.